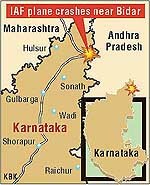 Two pilots of the Indian Air Force’s Surya Kiran aerobatics team were killed today following an accident during a routine training sortie when their plane crashed on the outskirts of Bidar in North Karnataka. The Surya Kiran aerobatics team is based at the Bidar Air Force Station and comprises indigenously manufactured Kiran Mk II aircraft. Is Jaya Bachchan's disqualification from the Rajya Sabha membership justified? There is nothing special about Bidar— a small 10th century town located at the cusp of Karnataka, Andhra Pradesh and Maharashtra. But next year will change it all. Come 2007 and Bidar skies will reverberate with the deafening sound of Hawk advanced jet trainers (AJTs). Some areas of the Navi Mumbai township were placed under curfew after violence continued there for the third consecutive day today, the police said. Residents today observed a bandh in protest against the murder of a businessman here last night. He had been receiving extortion demands. The businessman, Narinder Arora, a plywood dealer, was shot at point-blank range in the head while closing his shop on the Chatrawas road. He was taken to a private nursing home but was referred to the PGI, Chandigarh. He succumbed to his injuries on way to the PGI. Pistol shooter Samresh Jung fired a grand double, pocketing gold medals in 25m air pistol and 25m standard pistol pairs events at the 18th C'wealth Games here today. I am relieved at winning this gold medal after yesterday’s disappointment in an event where Vivek and I were the title holders. Nine soldiers were among 10 injured when militants detonated a car blast on the Srinagar-Baramula bypass here today. The Hizbul Mujahideen has claimed responsibility for the blast. The Inspector-General of Police, Mr K. Rajinder Kumar, said the militants had parked an explosive-laden car at the Rawalpora bypass. The Prime Minister, Dr Manmohan Singh, is keen to get the Hussainiwala border opened for travel and trade between India and Pakistan. At present the trade between the two countries is allowed through the Wagah border in this part of the country. Air-India will fly its Amritsar-Birmingham-Toronto flight for six days a week from this coming May. Looking at the response of this flight that operated thrice a week, Air-India has taken this decision, less than a year after it re-started flights from Amritsar.